4Videosoft PDF to Word Converter for Mac can freely convert PDF to Word .doc on Mac as well as convert PDF to RTF formats for reuse. Also, it can convert PDF with the original text, images, graphics and layout. 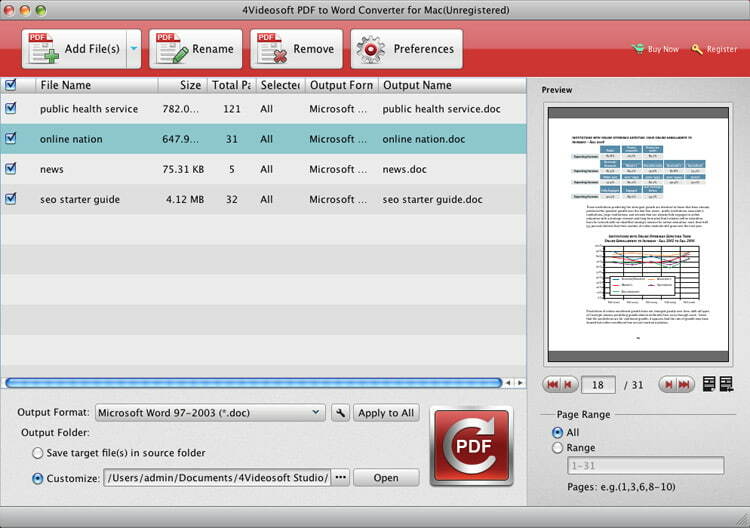 This Mac PDF to Word Converter allows you to convert all the added PDF files with one click. Also you can choose to convert all the PDF pages or the page (s) you want by input the number of page (s) or page range (s). 4Videosoft PDF to Word Converter for Mac enables you to convert PDF files to Word .doc for Microsoft 97-2003 and convert PDF to Rich Text Format (.rtf) formats for reedit. The OCR technology helps you convert the image-based PDF files to Word on Mac. Also it allows you to choose the convert mode (Accuracy, Balanced, and Speed) and output language so as to improve the accurate of the output Word file. With this PDF to Word Converter for Mac, you can convert all pages of the PDF file or the specific page (s) you want. This PDF to Word Converter for Mac can convert PDF files with multiple languages, such as English, French, Italian, German, Danish, Turkish, LatinGreek, Cyrillic, etc. Batches conversion to convert all input PDF files simultaneously so as to save your much time. 4Videosoft PDF to Word Converter for Mac has the intuitive graphic interface and advanced technology, which can help you convert PDF to Word on Mac with the high speed and high quality.